Innodisk Serial ATA Disk on Module (SATADOM) supports SATA III standard (6.0Gb/s) interface with excellent performance, and SATADOM-ML 3IE3 V2 is designed as the smallest form factor size that could enhance compatibility with various design applications. Innodisk Serial ATA Disk on Module (SATADOM) supports SATA III standard (6.0Gb/s) interface with excellent performance, and SATADOM-SH 3IE3 V2 is designed as the smallest form factor size that could enhance compatibility with various design applications. Innodisk Serial ATA Disk on Module (SATADOM) supports SATA III standard (6.0Gb/s) interface with excellent performance, and SATADOM-SL 3IE3 V2 is designed as the smallest form factor size that could enhance compatibility with various design applications. 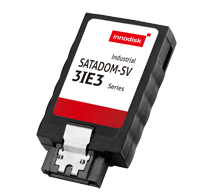 Innodisk Serial ATA Disk on Module (SATADOM) supports SATA III standard (6.0Gb/s) interface with excellent performance, and SATADOM-SV 3IE3 V2 is designed as the smallest form factor size that could enhance compatibility with various design applications.